Coming into the week, Radford University baseball held a paltry 4-10 record away from the RU Baseball field so far in the 2011 season. However, with two solid inter-conference victories in Clinton, S.C. against Presbyterian College, the Highlanders move into prime position to begin a run for the Big South Tournament trophy with home league play revving up soon. Facing a tough league opponent on the road is never easy, but the Highs sure made it look that way in the first game of the series, which took place on Friday, April 1. Junior outfielder Zach Costello made sure the April Fool’s Day joke was on Presbyterian when he ripped off three home runs on the same afternoon, tying a school record on the way to a 9-1 stomping by the Highs. Costello eventually went 4-4 on the day and notched five RBI in the process. Junior third baseman Matt Mack also went 4-4, hitting three doubles and tallying another RBI. Mack, along with junior outfielder Matt Hillsinger who went 1-4, both extended multi-game hitting streaks during the first match up of the three-game series with Presbyterian. 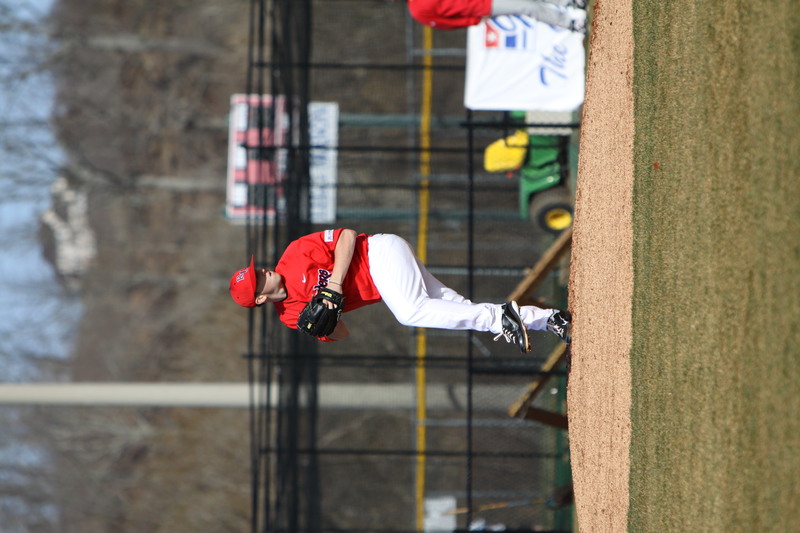 While RU’s torrential downpour of offense continued to drown Presbyterian, another solid outing by sophomore starting pitcher Eddie Butler, who pitched eight stellar innings, made sure that Presbyterian had no chance. Butler left the game with six strikeouts and surrendered just two hits after allowing only one earned run on the evening. Butler’s record on the season now stands at 4-1. The next day in Clinton saw a much tighter game than the afternoon before, as Presbyterian came out of the box swinging away at junior starting pitcher Mark Peterson. Peterson left the game in the seventh inning with RU clinging to a 5-3 lead after striking out seven batters and allowing just five hits. Peterson’s solid performance kept RU in the lead, but it wouldn’t stay that way for long. Hillsinger, who had two RBI on the evening while extending his hitting streak to ten games, and senior infielder Alex Guerra both went 3-4 on the afternoon. The Highs accumulated a two run lead heading into the bottom of the eighth, but saw that lead evaporate after junior relief pitcher Jason Patten gave up the go-ahead run in the middle of a three-run eighth inning explosion by Presbyterian. RU, whose offense made a habit of getting their bullpen out of trouble since the beginning of the season, was unable to answer in the top of the ninth. The game ended in disappointment for the Highs, who lost 5-6. Patten, whose ineffective pitching allowed Presbyterian to get back in the game in the eighth, was dealt the loss. With the week’s three-game series tied 1-1, the Highs and Presbyterian played the rubber match of the week on Sunday, April 3. In contrast to the previous two contests, this game was fairly low scoring and was decided by just one run. Senior starting pitcher Bobby Bolling pitched a nearly flawless seven innings, striking out four batters while surrendering just six hits and two walks. Bolling has enjoyed an up and down season so far, as his record heading into the afternoon stood at an even 2-2. Mack went 2-4 at the plate, notching two RBI in the process. Hillsinger provided almost as much offense by hitting an identical 2-4 and accounting for the last RBI for RU on the day. Although the Highs tallied just five hits, they were able to cash in their opportunities while limiting Presbyterian to just two runs, both scored in the bottom of the eighth. Presbyterian never led in the game, and eventually fell in a low-scoring affair, 3-2. Bolling was awarded the win, while junior closer Abram Williams picked up the save after pitching his way out of a bases-loaded situation in the bottom of the eighth, and then throwing a scoreless ninth. With the two road league wins, RU improves to a respectable 16-11 record overall, and a 2-4 record in the Big South conference. The Highs will continue their 10-game road stretch with a tough matchup against top ranked Virginia on Tuesday, April 5, at 6 p.m.